Special issue of Off the Record for John Milton anniversary in 2008. In 2008, the Turnbull Library’s acclaimed collection of work by and about the poet John Milton (1608-1674) was featured in a year-long celebration of 400 years since Milton’s birth. 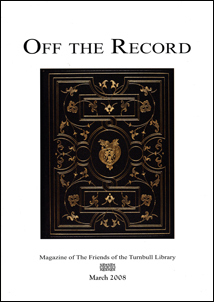 A special extra issue of Off the Record was produced by the Friends of the Turnbull Library to mark the occasion.